It's Holiday Lottery Calendar Time!! in our community by buying our Holiday Lottery Calendar! For only $10, each lottery calendar gets the chance to win $100 on every weekday in January, $150 on each Sunday in January and $500 on January 31st. AND - if you win you name goes BACK in the basket so you can win again (it happens!). But the best part is your donation will help Rotary do things like implement an addiction education program, help develop our young leaders, recognize and support people in the community who are doing service, donate books to the library and much more. 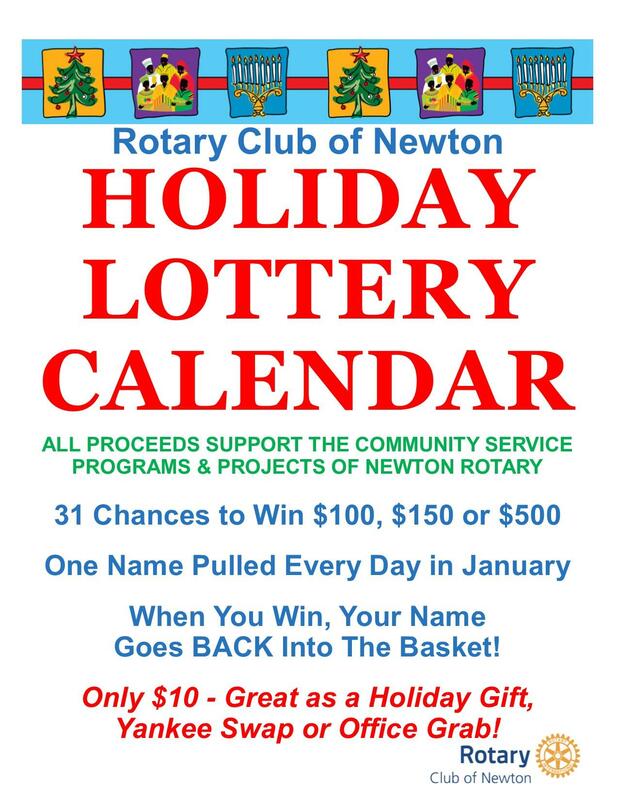 To get your Holiday Lottery Calendars simply contact your favorite Newton Rotarian or click HERE to email Sue who will send some out to you. Thanks!